The non spill 240ml Cherub Baby Glass Straw Cup is made from highest quality tempered thermal shock resistant borosilicate glass (commonly used in science labs) allowing bottles to transition safely from freezer to boiled water. The protective medical grade silicone sleeve not only provides super shock resistance; it changes colour if the liquid inside is too hot to serve to baby! The non spill glass straw cup sleeve will turn white when too hot with the patented colour change technology. The sleeve has an easy slip on/off design – it slips on and off in 2 easy steps . The glass straw cup grows with baby. 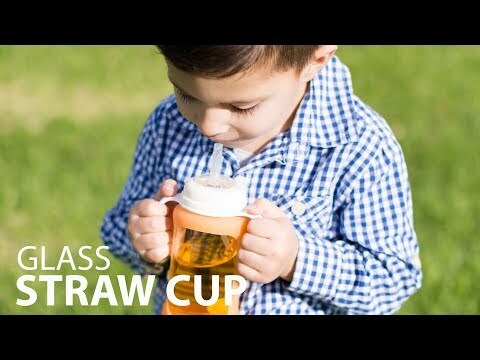 The straw cup will last through the toddler years. After which the bottle can convert to a glass food storage container with the food storage (travel) seal. Safe, reliable, durable, washable and 100% BPA Free, for peace of mind and a non spill glass straw cup that will last and last.